Jewish-style babka is a yeast-raised, bread-like pastry layered with luxurious swirls of filling, from chocolate or cinnamon to dried fruit, cheese and nuts. And whether it's thanks to the renewed interest in Ashkenazi cooking, chefs like Uri Scheft -- who practically built a bakery empire on the strength of his stellar babka recipes, or its stunning Instagram-worthiness, babka is enjoying a renaissance. But for all of the variations, there's one that seems to have gotten abandoned to history -- until now. 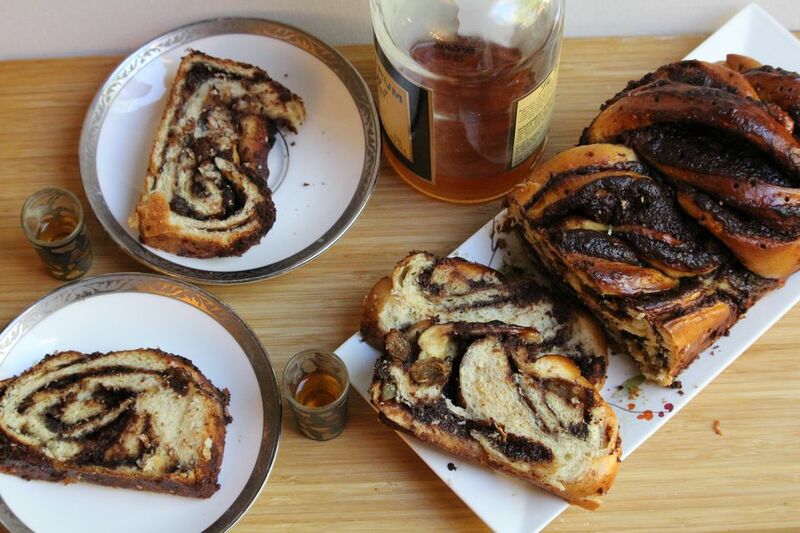 In the Encyclopedia of Jewish Food, the late Rabbi Gil Marks - a renowned food historian - notes that for Purim, some bakers would serve "shikkera babka (literally 'drunken grandma', an unfilled version drizzled with a syrup laced with whiskey or rum, akin to a French savarin and baba au rhum (technically babka au rhum). While that version probably looked most like the turban-shaped Polish babka, it still inspires this question: Why not a soused chocolate cinnamon babka? The answer: this party-ready, grownups-only babka. Tips for Teetotalers: If you crave a chocolate cinnamon babka, but not the alcohol, you can omit the rum. Just plump the raisins in warm water, and brush the babka with just enough sugar syrup to glaze the tops -- no need to poke holes in them first. In a a large bowl, or a stand mixer fitted with a dough hook combine the water and yeast. Allow to stand until foamy, about 5 to 10 minutes. In another large bowl, whisk together the flour, sugar and salt. Add to the yeast mixture, mixing with a wooden spoon or the mixer’s dough hook on medium speed. Add the eggs one at a time, mixing after each addition until they are incorporated. Add the butter or oil a little at a time, mixing until the dough begins to pull into a ball. Knead with the dough hook for 5 minutes, or by hand on a lightly floured surface for 5 to 10 minutes, or until the dough is smooth and elastic. (It's fine if the dough is a little tacky, but if it is very sticky, knead in additional flour, 1 tablespoon at a time, just until it is easier to handle.) If you’ve been kneading the dough by hand, return it to the bowl, cover and allow to rise until doubled, about 1 to 1 1/2 hours. While the dough is rising, prepare the filling: In a small, heavy bottomed saucepan set over medium heat, combine the butter, sugars, and chocolate. Stir until the mixture is well combined and fairly smooth. Remove from the heat and stir in the cocoa, cinnamon, and honey. Set aside. In a separate small bowl, combine the raisins and rum, and set aside. Grease two 9-inch by 5-inch loaf pans. When the dough has risen, punch it down gently and divide in half. Transfer to a lightly floured surface and pat the first piece of dough into a rectangle. Roll the dough out until it is about 11 inches by 15 inches, and about 1/8-inch thick. Spread with the chocolate cinnamon filling, leaving a 1-inch border around the sides. Sprinkle evenly with half of the the rum-soaked raisins or cherries. Starting on a long side, roll the dough up jelly roll-style. Pinch the ends together gently to seal. Place the roll seam side down. With a sharp knife, cut lengthwise through the roll–don't worry if some of the filling oozes out–shaping the babka can get a little messy! Lay halves side by side, filling side up. Starting in the middle, and keeping the filling side up as much as possible, twist the rolls together by laying one over the other until you get to the ends. Pinch the ends together to seal. After you've twisted one end, do the other side in the same way. Repeat with the remaining dough and filling. Preheat the oven to 350 F. Place the pans on a piece of foil or a baking sheet to catch any drips. Bake the babkas in the preheated oven for 30 to 35 minutes, or until the tops are golden and a tester inserted in the dough comes out clean. While the babkas are baking, make the syrup: In a medium saucepan, combine the sugar, rum, water and vanilla bean (if using). Bring to a boil over medium high heat. Reduce the heat and simmer, stirring frequently, until the sugar is dissolved and the mixture is syrupy. Remove from the heat and set aside. When the babkas come out of the oven, place them in their pans on a cooling rack. Poke all over with a skewer, then brush or spoon the rum syrup over the babkas, letting them absorb the syrup as much as possible before adding more. Allow the babkas to cool before removing from the pans. You Say Potica but I Say Povitica. Which Is It?